Curries and gravies can be prepared in almost infinite ways. The same thing applies to meatballs that have so many variants across the globe. Today's recipe is for those who like a bit of spice on their tongue. Although, you can lower the spices as per your taste, reducing them will not give the authentic taste of this recipe. To give a rich creamy consistency to the gravy, I've used cashew nuts in this recipe which is combined with fennel seeds paste. The whole spices mentioned here are easily available in almost every part of the world. This recipe can be kept for 2 to 3 days easily. So let's make this rich and creamy meat preparation which goes well both with steamed rice or bread. 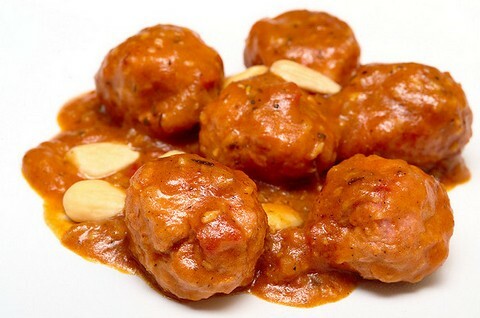 Make this main course entry made with tender lamb mince balls flavored to perfection and dipped in creamy and flavorful curry base made from cashew nuts. Take fennel seeds, green cardamom, black peppers, dry red chilli, black cardamom, cumin seeds and cloves in a pan. Roast them for about 4 to 5 minutes and powder them in a blender. Soak cashews overnight and blend them into a fine paste with some water. Take onions, tomatoes, garlic cloves and ginger piece in a blender. Add 1/4 cup of water and make a paste. Keep aside. Take lamb minced meat and add gram flour, minced green chillies, red chilli powder, ginger garlic paste and salt. Mix it well with your hands and make small meat balls. Heat oil in a deep frying pan and fry all meat balls till light golden brown. Add 1/4 cup cooking oil and let it heat for about 3 minutes. Add onion tomato paste in it and saute for about 3 to 4 minutes. Add whole spices powder prepared in the first step along with cashew paste and stir fry for about 2 minutes. Add hung curd, turmeric powder, mace powder and salt. Saute for about 3 minutes and add two glasses of water. Let it simmer on the low flame for about 20 minutes. Add fried meat balls and bring down from the flame. Garnish with blanched almonds and serve hot.